Welcome to the official TBM community on Livejournal. This community is for all the fans of the band to get together and meet one another. Have a show coming up near you? Meet other people in the area that are fans of TBM. Enjoy your stay, and the band do frequent the community from time to time! Hey guys! Just felt like reviving this community since it hasn't been updated in a few years. Just wanted to say I finally got to see The Birthday Massacre for the first time in November as an early bday present to me from me. :3 It was amazing you guys! I'm so glad I got to be in the same room with my inspiration! They're so fun and nice too. :) I knew there was a reason I loved them so much other than their music of course. And to those who like making videos they're having a fanmade music video contest for their new album. Check out their facebook for more details. I already got a crew together and we intend to participate as well. The due date is March 9th so if anyone wants to join whip out those cameras!! ok seriously now what happened to O.E.? My name is Mark and I'm a photographer. I recently shot their shows in Orlando and St. Petersburg. You can view them over at www.markvphotos.com. When you go there, click on my YouTube page and you can view the ENTIRE St. Petersburg show there! It's pretty decent quality. I was suppose to get an interview, but it didn't work out. :[ But I did find out Chibi's real name! I heard it's very secretive. Anyway, enjoy the photos and videos! 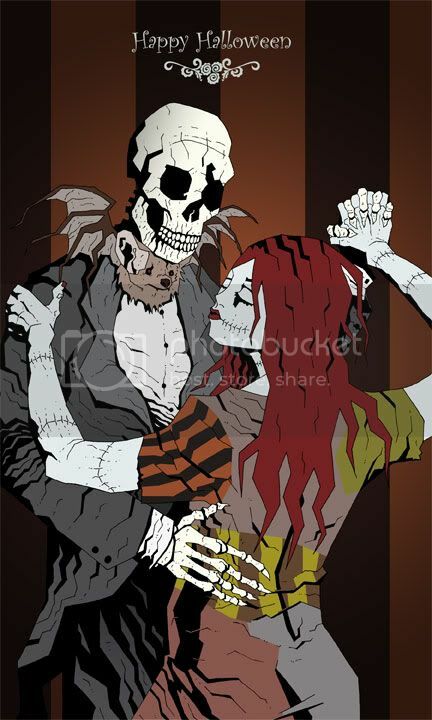 The old official TBM deviant art account has been converted into one of the new Deviant Art groups. Incase people are interested in still submitting their artwork into the DA community you no longer need to wait for someone to approve the submissions and re upload them to the account, DA makes it easier now, so if you have a chance be sure to add the group and join as a member to share your fan art etc. Where in the world can I find TBM's hoodie??? :( Did they disappear off the face of the earth or something? So tbm was amazing as usual at free fest, there were some haters but they're just jealous they don't love tbm! I got some pictures with my phone, nothing too spectacular but they're still pictures! If any of you guys went please post pictures! oh and btw i'm MicHELLeMassacre on the violet prison boards. If there's anyone in the DC/MD/VA area, you should vote for the birthday massacre to play at the virgin mobile free fest!!!!! I've been taking advantage of unlimited texts and texting "birthday" to 59907! or voting online at virginmobilefestival.com and clicking on book the band! Please vote guys! i need to see them again! Anyone going to show mind giving me a ride? I really want to go, but will need a ride. I can pitch in for gas or pitch in for parking! Anything ^_^ I just need some friendly people who I can trust to take me to and back. I also wouldn't mind staying after the show to meet the band. So just message me and we can talk details. I'm pretty easy to get along with and wouldn't mind making some friends along the way! Not a lot of people around these days, huh? I figured with tour season my friend's page would be lighting up with posts from this group. Anyways the Birthday Massacre's new CD Show and Tell is finally available on Amazon. I can't wait to get one. Anybody in DC or Montgomery County going? Maybe wanna allow me to hitch a ride to and from? I'll split the cost of gas. I'm terrified of not being able to go. I've not missed a single DC/Bmore area show since 2004 and I'm planning on starting now. 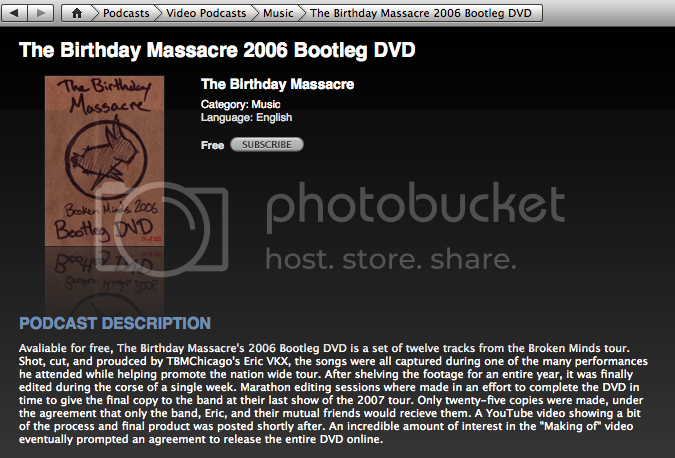 Just a small bit of news about my Birthday Massacre DVD - it's now up for free on iTunes! If you want to download it on iTunes instead of the site for some reason, you can do that here. Otherwise it's available at TBMChicago. It's quickly become more downloaded than the Looking Glass EP, which is really exciting! For those who don't have Myspace or Facebook (all 1 of you), here is a bulletin just posted from TBM. Thus far, IMHO, 2009 is looking better and better. We want to tell you that we will be releasing a "live" CD and DVD of our Hamburg Show from the Walking With Strangers tour of 2007. We have been working on the files for a few months and we feel confident that we can release a product that comes up to our standard and one that our fans will appreciate. The DVD will be 5.1 Sound for the best live effect. We have not decided whether to release them separately or as a package..... we will let you know when we know! As well..... we have been working on a brand new record and we feel confident it will be ready in the Fall of 09. We have written most of the songs and we are in the process of recording. We feel that this record will be another step along our path and we hope that it is received with the same enthusiasm that our previous releases have been. Because of all this work, we are not going be able to tour for the next few months but.... as with the last record, once we get out on the road we will probably stay there for the next couple of years. We are only able to do these projects because of the people who have reached into their pockets and spent some of their hard earned money to hear us, see us or wear us. We thank all of you for your support and we are constantly aware that you are part of our what we do in a very important way. We know that people are discovering us every day because of the messages we receive, but our best way of getting the word out is through you, the people who already know us. We hope you will help us to reach more people this year and hopefully we can go to more places in promotion of these records. We wish you all a great new year and keep checking for further updates. Hello Hello fellow Birthday Massacre fans! Only just joined this community (what's taken me so long??!!) and am most excited to be part of it. Been a big big fan now for over a year and can't get enough of them. I live in the UK, Aberdeen Scotland to be precise and as you can imagine I still haven't seen these guys live....yet!